The CMM-1000 is an all electric cordless mower. I have no idea what, if anything, "CMM" stands for. I bought mine sometime around 1993. At that time all Black & Decker outdoor equipment was forest green and black. At some point they changed to the orange/black they use now. I believe the 1000 model is no longer produced but has been replaced by the CMM-1200. The CMM-1000 is on the right in the above image. The fix done under the recall replaced the battery at no charge. I never experienced the problem noted in the recall. I liked this mower. I could mow during ozone restricted days. It would have been perfect if it had a longer set of handles to accommodate a tall guy. Join in and write your own page! It's easy to do. How? 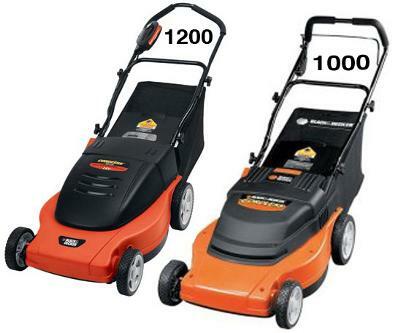 Simply click here to return to Black and Decker Lawn Mower Consumer Reviews.